Q: Is solar bag waterproof? A: The solar bag is weather resistant which means it will resist the occasional rain or snowed, it is not design for immersion in water. 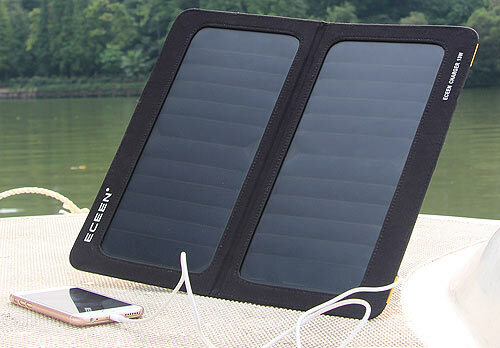 Q: What’s device can charged with this solar charger? Q: How long does it take to fully charge battery pack or mobile phone from empty using? A: the charging time will be difference base on solar bag power, sunshine and power bank or mobile phone capacity etc. Generally speaking, for 6.5W solar charger, under clear sunny days, charging iPhone 5, the time is around 2 -3 hours, the charging time similar to AC charger. Q: How long can I get best performance from the solar bag? A: You should ensure the solar charger is outside in direct sunlight and that the solar panel is in no way shaded. For best performance, the solar panel should be perpendicular to the sun. Q: Why is the charging time increased when I used the solar bag behind windows? A: Some windows might have been tinted with solar film that black infrared/UV light. This will reduce the solar cell efficiency, hence increased the charging time. Q: Can I charge my devices in cloudy day? A: Yes, it is ok to charging devices in cloudy day. But the charging efficiency will be lower down .and the charging time will be prolonged. Q: Can I charge my devices in home lighting? A: No, The solar bag can't charge device under home lighting. Previous news:This is a winner! An excellent buy and super portable! Next news:Background - New to Solar Panels? Read this.